Get your Ukrainian fiancé or spouse to the USA. Get your Ukrainian fiancee or wife to the US fast! Do you need to bring your loved one from Ukraine to the US on a Fiance or Spousal visa? We process more family visas than anyone, and we do many out of Ukraine. We are here to help. Visa interviews: By appointment only, Monday-Friday. Applicants should arrive 15 minutes prior to their scheduled time to go through security. 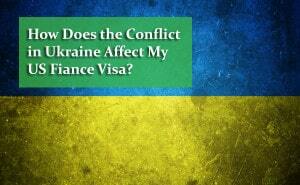 Embassy Phone Number: (044) 383-8066 in Ukraine or (703) 988-7107 in the United States. Where to pay the Embassy fee: At a Raiffeisen Bank branch in Ukraine. Medical Examination Fee: The fee for a medical exam is not more than $125 per person, excluding the vaccination fee for adults and children. The clinic accepts payments for medical exam and vaccination fees in Ukrainian Hryvnya only. Embassy appointment scheduling method: Either online at http://www.ustraveldocs.com/ua/ua-niv-appointmentschedule.asp, or by contacting the Call Center at 044-383-80-66 (if calling from Ukraine), or (703)988-71-07 (if calling from the U.S.). By following the advice of RapidVisa, our process went perfectly. They provided us with step by step instructions and answered all of our questions very quickly. The result was approval of our K1 Visa petition without any problems at all. I recommend RapidVisa to anyone going through this process. I have heard many stories about people who tried to do it on their own and had many difficulties and delays. We had none of that due to the folks at RapidVisa. To those of you using RapidVisa, the wait for USCIS review of your petition is long and frustrating. But be assured, once they approve it, the process goes very quickly. Be patient and follow the directions provided by RapidVisa and your result will be as happy as ours. We couldn't be happier with how the whole process went. Thank you very much for all your help with our fiance visa. God bless you for your work. Working with Rapid Visa made the process of obtaining a fiancé visa a lot easier than trying to do it on my own. They were always there to answer questions quickly and prevent delays which could have occurred if i had to spend endless hours going back and forth with immigration services. They reduced the leg work considerably. Also the staff was very polite. I just want to say the Rapid Visa ROCKS!!! Thanks so much for what all you guys do! Saved me $1000's..Also the live chat was great. The staff on live chat is great. Had quick answers to all my questions. I was so surprised, I had already paid, but they still treated me with respect. It was like I was a potential new customer all the time. .. I want to thank y'all for your help. We are about to do an AOS for my wife. I met her online and then went to see her in Ukraine December of 2010. I had printed all the forms from the USICS site and thought I was prepared to put together a K-1 application. She and I met and together we tried to make heads or tails out of the document demands. I returned to the states more confused than when I went to see her. I was in shock, thinking I needed a lawyer, which I knew would be impossible for me to do. After I arrived home, I went on line, and found your site. Grudgingly I paid the fee and went through the steps you provided. Putting it together was made much simpler using the format you provided. With your help I did not need to understand what was being said on the forms but with your system I concentrated on just obtaining the proper documents needed. The whole process is complicated; but, your program makes it much more manageable. It took two months to accumulate and compile the application and send it to my wife to be.In February I received my notice of action in which immigration had received my application. A friend locally also brought a wife from the Philippines, unbeknownst to me, and one day we met and I discovered he had a wife from overseas. After talking to him I decided to make an Easter trip to see my fiancee. The trip was successful, we both needed it and I obtained more evidence. Every time I called Rapid Visa, Ben or Kieth would always allay my fears and case of nerves with their common sense advice. Finally in August of 2011 I received the notice of action that our application had been accepted and moved to the NVC to be forwarded on to the Embassy in Ukraine. Finally she received her notice and we scheduled an interview. Again we were on pins and needles, getting this information, that information, and we decided I needed to return a third time to be with her during the interview. I arrived the day before her physical was scheduled and two days before the interview. Fortunately we were prepared, again thanks to the advice and information provided by Ben and his people. She went into the interview room ready for bear, loaded with information,evidence, photos, and expectations. The interviewer asked her if she understood and could speak English. She said no she could not. He promptly asked him in English; what is his name and how many children does he have. She answered with assurance and correctly, in English. Then he asked her where was her fiance and when he knew I was in the waiting room; he had ther get me. He swore me in to affirm the veracity of our statements. Then he asked her what she was going to do in America in which she grabbed my arm and said; I am going to cook for him. He merrily stated she had her visa. It is beyond me to tell anyone what to expect in these interviews. While there we saw a couple turned down. The process of AOS is just as nerve wracking but Rapid Visa is a big help. With my wife here, life is just better, regardless of the process. Thanks Ben and all! Thanks to the help of Rapid Visa my wife and I are now happily together. We researched many sites before choosing Rapid Visa and we were not disappointed. Their process is quick and easy to understand. The price we paid was more than worth the service we received. All the forms were filled out correctly and all our questions were answered very quickly. We didn’t have one error on our visa or adjustment of status applications thanks to Rapid Visa. We also had a minor child included on the K-1 visa at no additional charge. I strongly recommend Rapid Visa to anyone who needs any of their services. I wanted to write you and your staff today with my sincere thank you for all your work and dedicated service. Today we received our green card. From start to finish, your process and guidance helped us so very much. I know my calls were numerous and sometimes quite panic'd and your teams guidance was spot on. I have already sent a few friends to rapidvisa and will continue to send clients your way due to your great service and commitment. I must tell you, the friends I know that have used your service are all full steam ahead in this process, and someone i know who decided to use an alternate route is still waiting and wishing they had used your service. If I can ever be a reference or give any testimony, please let me know. Viktoriya and I want to send our gratitude for all the work/help that Rapid Visa provided us during our K-1 Visa application. Although at times I worried about the longevity of this process, everything went as I was instructed by Rapid Visa. We are now happily married and look forward to a long and bright future together. I'm now looking forward to use Rapid Visa for my "Adjustment of Status" paperwork. In my search to find a responsible, honorable & fair valued company to guide and organize the myriad of documents and forms through the USCIS Fiance Visa regulations and continual submissions, RAPID VISA was the OASIS in the desert. I approached many companies during my search and always felt a level of violation and insecurity with them; then RAPID VISA came on the radar. RAPID VISA removed all the clouds and doubts of this insane process with a clear, concise, mentored and programmed approach. The woman I so desperately love, now my wife, is now in the United States and has just received her Green Card. RAPID VISA was their for us from the beginning to the present. We will continue to avail ourselves of their excellence in the ongoing steps that still await us. BRAVO RAPID VISA....our Friends and Mentors. Ron and Olena Sirmans would like to thank the people at Rapid Visa for their tremendous help and assistance in our quest to acquire a Green card. We visited your office in Colorado and was impressed with your operation and professionalism. The entire process from change of status to Green card took only 3 months. We extend a special thanks to Ben, Rick and Chona for their patience and support in everything. We would highly recommend Rapid Visa to any one, and will. Thanks again to the people of Rapid Visa who has brought such happiness for us! We would like to say "thank you" and for anyone that needs a visa. "This is the way to go". We were given a visa from Kiev Ukraine without any problems. And your site made it simple and saved us time and money..."thanks everyone".